No hot water? We can help! 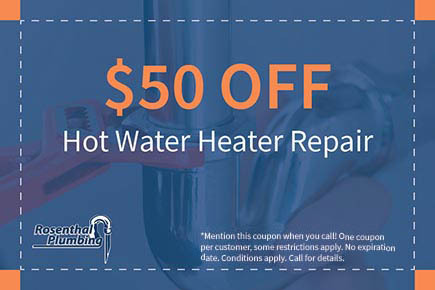 When you need hot water, you need it now! We’ll come assess your hot water heater, figure out what’s gone wrong, and get things up and running for you fast. Broken, leaky pipes can be a homeowner’s headache! 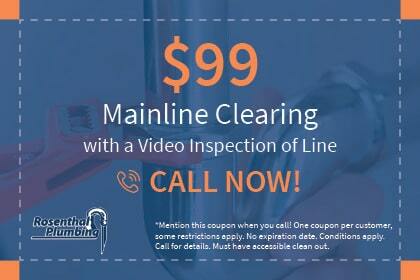 We’ll come repair or replace your broken pipe so you don’t have to worry about it anymore. 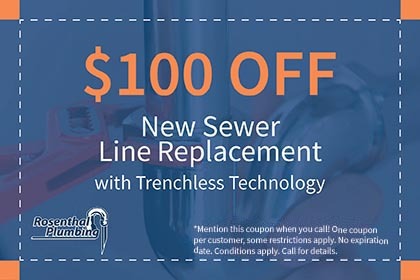 Sewer line problems? We'll fix it! Most homeowners dread sewer problems. Let us take care of the problem so you don’t have to worry. We’ll use the latest technology to fix your sewer without disrupting your life. Clogged drains? Let us help! Drain clogs are annoying and can bring your life to a grinding halt. We’ll come remove them the professional way, so you don’t have to worry anymore. No matter what kind of plumbing issue you're facing, we're here to help 24/7. Give us a call! For the best when you need a plumber in Santa Cruz County, rely on the professionalism, expertise and first-class friendly service you get when you choose Rosenthal Plumbing. Rosenthal Plumbing is a 3rd generation, family owned and operated business and have been delighting local residents with our expert plumbing and drain services for over 25 years. Our #1 goal is customer satisfaction, you can read about our guarantees here and what other delighted customers have to say here. 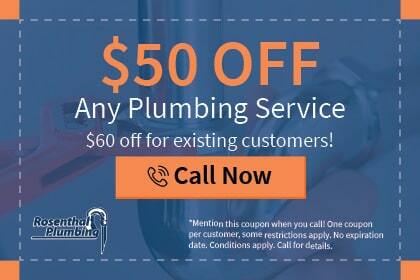 Rosenthal Plumbing service is knowledgable, courteous and keeps appointments. Phones are answered quickly and Eric does an excellent job of scheduling the jobs. Corbin took care of my "sewer" needs in a timely manner. When they were finished, everything was cleaned up. I would highly recommend this company. Rosenthal Plumbing is fantastic. 3 business days after my initial inquiry "Pete the Plumber" showed up and was very personable, knowledgeable and professional. It was a pleasure guys! I highly recommend calling these guys. Had a tight schedule that they were able to accommodate on very short notice. Had “Tim S.” Come by and was courteous, insightful, and overall very helpful with the services he provided. 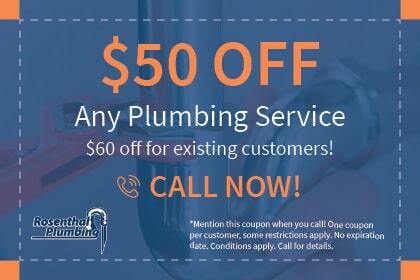 Get exclusive access to over $700 in coupons plus a whole house plumbing inspection voucher! Rosenthal Plumbing delivers a first class, professional service each and every time. You'll know the full price of the repair or installation before you give us the go ahead, and no matter how long it takes, you still only have to pay the quoted price. When you hire Rosenthal Plumbing, you can relax knowing we'll look after your home. We use shoe covers and work mats to keep work areas clean and tidy and we even clean-up before leaving. Get priority service and the peace of mind that comes with knowing that your plumbing problems will be taken care of the right way, every time. Our members also receive special rates and complimentary services, because that’s how much we value their trust. Join today and become part of the Rosenthal family.